Under intense pressure from the United States, Nouri al-Maliki finally stepped down as Iraq’s prime minister and pledged support for his successor Haider al-Abadi. The move was hailed by the White House as offering an opportunity to halt the raging Sunni Islamist insurgency threatening Baghdad. I was also said that Iran had put pressure on al-Maliki to step aside. 74th Prime Minister of Iraq. According to several media reports, Mr. Maliki appeared alongside his successor and announced the withdrawal of his candidacy. The former PM also vowed support for the formation of the new government to be spearheaded by Mr. Al-Albadi. Mr. Al-Albadi will take over as Iraq’s next prime minister. 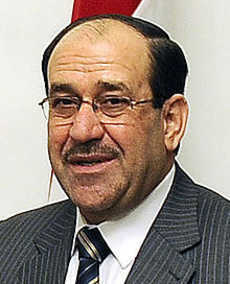 He is an ex-exile who was formerly close to Nouri al-Maliki. In a press statement in Washington DC, US Secretary of State John Kerry commended the important and honorable decision by Prime Minister Nouri al-Maliki to support Prime Minister-designate Haider Al-Abadi in his efforts to form a new government and develop a national program in line with Iraq’s constitutional timeline. Secretary Kerry urged Mr. Abadi and all Iraqi leaders to move expeditiously to complete the process, which is essential to pulling the country together and consolidating the efforts of Iraq’s many diverse communities against the common threat posed by the Islamic State of Iraq and the Levant. In addition, the United States pledged to stand ready to partner with a new and inclusive government to counter this threat, and we will encourage other countries in the region and international community to do the same. Iraq’s notorious rebel fighters seized the country’s second-largest city of Mosul this June. The rebel fighters popularly known as the Islamic State of Iraq or ISIL made advances in the city where hundreds of rebels launched an assault on Mosul, creating clamor and mass displacements in the city.